Sometimes you need a little bit of a bird’s eye perspective to truly gain an appreciation for your surroundings, even if it’s only for a moment. The best way to do this in Big Bear is to take to the waters of Big Bear Lake and get your blood pumping as you fly high above! It’s already quite inspiring to visit Big Bear’s dynamic setting of jaw-dropping mountain views, tranquil expanses of dense forests, and peaceful, serene lakes. However, there’s nothing like taking in these alpine wonders from up above, on an aerial parasailing expedition in Big Bear! Make once in a lifetime memories while experiencing Big Bear in a way that words can hardly describe by going on a Big Bear parasailing session! With the sparkling surface of Big Bear Lake as your scenic backdrop for adventure, parasailing provides a unique perspective for enjoying the beauty of Big Bear in a whole new way. Learn more about how you can parasail in Big Bear below! There’s nothing comparable to the exhilaration and overwhelming sense of freedom that can come with parasailing. Soaring on air currents, you can see everything that there is to love about Big Bear: the vast expanses of dense, lush pine tree forests that comprise San Bernardino National Forest, accented by the striking mountain peaks that appear on the horizon, all enveloping Big Bear Lake’s shimmering waters. But where can you go to grab a piece of this parasailing in Southern California action for yourself? Fortunately, Big Bear Lake is home to many marinas, charter services, equipment rentals, and lesson-providers. Over twenty-three marinas alone are situated along its lengthy shoreline! Pine Knot Marina is one of the many marinas located along Big Bear Lake’s shores. Offering parasailing charters amongst a bevy of other rentals and charters for everything ranging from fishing to waverunners, Pine Knot Marina allows you to soar over the glittering waters of Big Bear Lake at a dazzling height of 7,000 above sea level (over five hundred feet above the lake itself). For as little as $80 for a single rider and $160 for a tandem parasailing session, you can have an unforgettable experience during your time in Big Bear! Alternatively, if you haven’t worked up the courage to parasail in Big Bear just yet, observers can ride along for a mere $20. Oftentimes, the minimum age requirements for Big Bear parasailing with Pine Knot Marina and other parasailing charter services, such as Big Bear Parasail and Watersports, is six years of age, with children under the age of eighteen being required to have a parent or legal guardian sign the waiver prior to boarding. There are also weight requirements for single and tandem riders for safety purposes. On Big Bear Lake, the parasailing season generally lasts from late May until mid-September, during which time most parasailing charters operate during the mid-morning (around 10:00am) until the late afternoon (about 5:00pm) for maximum visibility and clearer weather conditions. 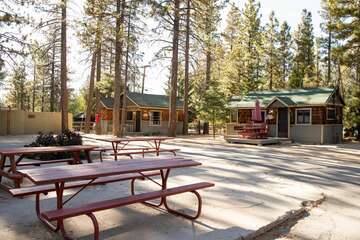 Since our cabins are located all on or near Big Bear Lake, they are guaranteed to be your best possible choice in terms of location. 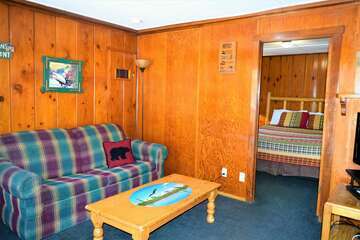 They also provide breath-taking lake-front views, where you can wind down after a long day of Big Bear parasailing. 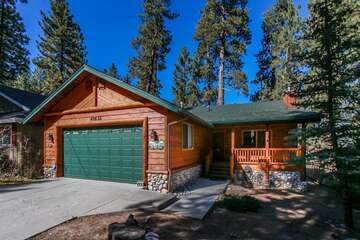 Contact Big Bear Cabins today to reserve your own slice of lakeside paradise by Big Bear Lake!